We awoke today to weather that is apparently more typical for Seward: low clouds. It made it easy to forget all the mountains that are nearby. We packed, checked out of the hotel, and headed to the nearby Subway sandwich shop for breakfast that was quite passable. After breakfast, we returned to the Kenai Fjords National Park visitor center so that Celeste could turn in her booklet for her Junior Ranger badge. Junior Ranger is a program the national parks have for kids 4-12 that encourages them to learn and explore, and to ask good questions. We had picked up a Junior Ranger booklet on the our first visit to the Exit Glacier visitor center. 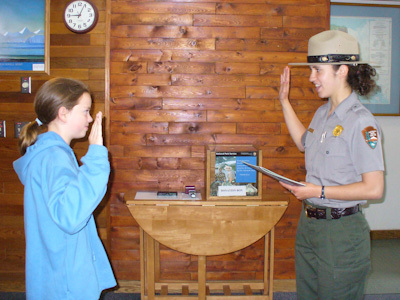 While Celeste knew the answers to many of the questions already, there was also an assignment that required her to interview a Park Ranger, and encouraging that kind of contact between kids and the rangers is always a good thing. She took an oath to protect the park (they always make it a good ceremony) and was given a small badge. We then drove to the town of Whittier, a former military town. 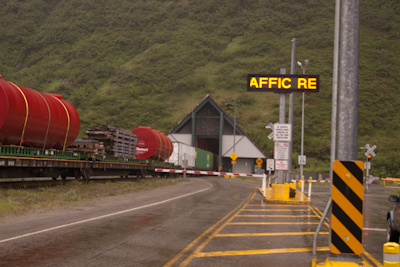 While not far off the main highway, Whittier is on the coast on the other side of a mountain, and is connected only through a one-way tunnel that is shared by vehicles and trains. There is a toll ($12 to go, free to return) and one waits in a queue not unlike that waiting to board a ferry until the tunnel is open in the direction you wish to travel. When we got to Whittier, there was heavy mist and it was fairly wet. We walked through its small waterfront with a few shops and restaurants and then through a tunnel to downtown. Downtown Whittier is not very attractive, with many derelict boats and a single high-rise condo building that nearly everyone lives in. The high-rise is a cold-war era military barracks built of heavy concrete to withstand both the harsh conditions and possible earthquakes and attack. We walked over to an adjacent building that housed the Whittier Museum and saw pictures of the aftermath of the great 1964 earthquake. Whittier was devastated by both the earthquake and by a tsunami that followed soon thereafter. Very little was left. Returning from Whittier, we had our picnic lunch in Girdwood, a bit further toward Anchorage. Girdwood was preparing (girding?) for a town festival for the July 4 weekend, so we found a convenient parking place and had our picnic out of the back of the minivan. Returning to Anchorage, we checked in again at the Marriott we had stayed at on Day 1. We went off to the Snow Goose where we had eaten that first evening, and all remarked on how quickly the two weeks had gone.